Please send me more information on Canopy Costa Azul Eco-Adventure! 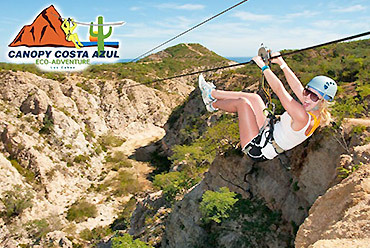 Zip lines, suspension bridge, extreme rappel, Tarzan swing (children only) and racing zip lines. Zip Lines: Ride on an aircraft grade steel cable using a pulley and a safety harness with a main safety strap (which can carry over 20 times your weight). Make your way across the zip line and an instructor will be waiting to assist you at the end. Suspension Bridge: Incredible 160 feet of bridge connects you to the rappel cliff, suspending your walkway high above the beautiful desert flora and fauna. Rappel: Descend down a 180 foot mountain wall using a figure 8 safety device; you will be completely in control of your descend with two instructors by your side. Tarzan Swing: A system of pulleys and ropes provides a perfect extreme playground for swinging across the desert Tarzan style. 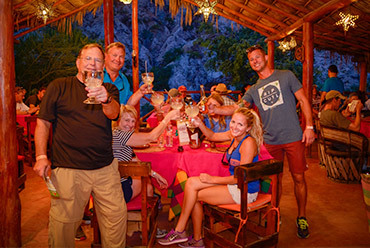 Perform your best aerial acrobatics in the newest, fun activity in Los Cabos. Round trip transportation (from SJC properties, CSL and Corridor are subject to availability), bottled water, Damiana Factory tour and tasting, trained/certified guides, climbing equipment, waiting area, parking space and wet towels, bilingual staff. Participants must be at least seven years of age and in good health. People who are intoxicated or pregnant may not participate.